Baphuon built by Udayadityarvarman II was the most poorly constructed of all the temples in Angkor. From the remaining ruins, it is possible to see how imposing it was. This temple hill was dedicated to Shiva, but in its reliefs many motives from the Vishnu epic can be seen. Restoration work continues to be carried out on the Baphuon. North o f the Golden Tower rises the Tower of Branze higher even than the Golden Tower: a truly astonishing spectacle, with more than ten chambers at its base. Prasat Baphuon is located 200 metres (656 feet) northwest of the Bayon and south of Phimeanakas. A enter and leave at the east. 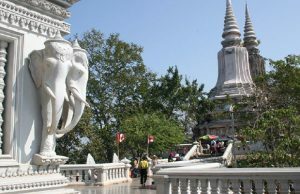 Access to the summit is difficult as much of the temple has collapsed and it is overgrown but for those stalwarts who want to go to the top, use the way with columns at the east and the temple of Phimeanakas on the left. Visitors should walk down the causeway, climb the steps to the first tier, turn left and walk around the temple, always keeping it on their right. It was built in middle of the 11th century (1060) by king Udayadityavarman II, dedicated to Siva (Hindu) with following Prasat Baphuon. BACKGROUND The grandeur of Baphuon as described above by Zhou Daguan is unrecognizable today because of the poor condition of the temple. 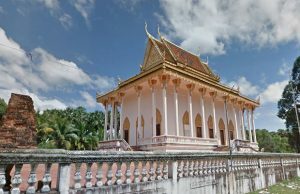 The French were in the process of restoring this temple when they were forced leave Angkor in 1972 because of war. Baphuon is situated inside the royal city of Angkor Thom but dates from the eleventh century and was built before the city was established. 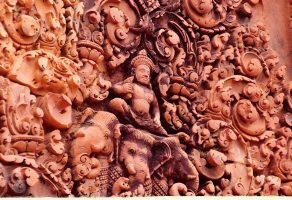 An interesting feature of Baphuon are the bas-reliefs which are scenes carved in small squares. Unfortunately few of these are visible because of the poor state of the temple. The narrative themes are realistic depictions of daily life and forest scenes. LAYOUT Baphuon is a single sanctuary temple-mountain situated on a high base. It is a symbolical representation of Mount Meru. A rectangular sandstone wall measuring 425 by 125 metres encloses the temple. A long sandstone elevated approach (200 metres) at the east entrance forms a bridge to the main temple. It is supported by three rows of short columns. Before walking down the approach turn left at the east entry tower and walk to the end of the gallery for a superb view of a four-faced tower of the Bayuon framed by a doorway of Baphuon. The approach is intercepted by a pavilion in the shape of a cross with terraces on the left and right sides. Turn left and walk to the opening the approach. Continue to the view of the arrangement of the imposing pillars under the approach. Continue to the end of the gallery to see a rectangular paved pool. Baphuon stands on a rectangular sandstone base with five levels that are approximately the same size, rather than the more common form of successively smaller levels. The first, second and third levels are surrounded by sandstone galleries. Baphuon is the first structure in which stone galleries with a central tower appear. Two libraries in the shape of a cross with four porches stand in the courtyard. They were originally connected by an elevated walkway supported by columns. The gallery of the enclosure collapsed and, at a later date, the stones from it were modeled into the shape of a reclining Buddha that spans the length of the west wall (the head is on the left, facing the temple) . It is an abstract form and the outline of this Buddha is difficult to distinguish. A stairway leading to the summit begins in the middle of the Buddha. The top level is in poor condition due to several collapses. Originally there was a Central Sanctuary with two wings. Each side of the entrance to the Central Sanctuary is carved with fine animated figures. If you look carefully you can see these from the ground on the west side. 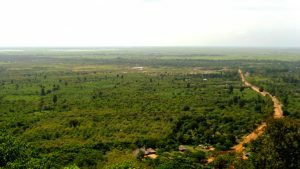 The view from the top with Phnom Bakheng in the south and Phimeanakas in the north is magnificent.